Most businesses consider their brochures to be one of their most effective sales tools. It conveys what you do and your level of professionalism. So it’s important to get it right. Minuteman Press Frankston can design and print, or print your design in a range of sizes and finishes, including but not limited to: 2 Page A4, 3 DL Z Fold, 3 Page DL. Common sizes include: DL – 99 x 210mm | A6 – 105 x 148mm | A5 – 148 x 210mm | A4 – 210 x 297mm. We have over 100 paper samples here at our office, we’ll help you select the best stock to get you results. Minuteman Press Frankston are design and print professionals. We can help you create amazing looking flyers and brochures, that will connect with your audience and bring you business. Have your own design? Not a problem, we can provide full colour, spot colour or black and white printing services on our professional digital press or offset press. We pride ourselves on delivering fantastic customer service and high quality print products. Want to promote a special sale, product or event? A flyer is just what you need. 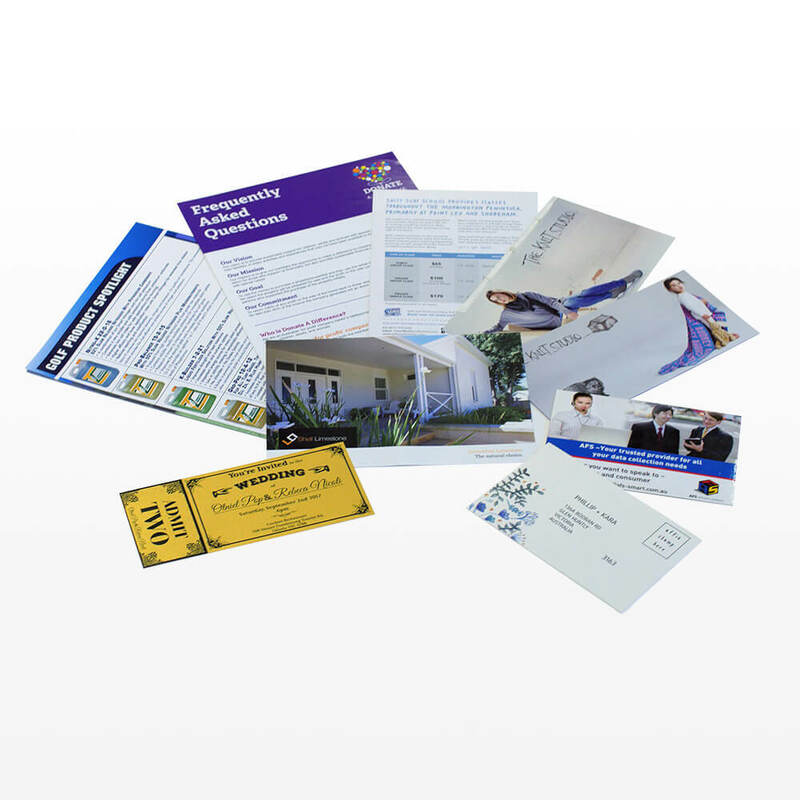 Want to promote your business, its products and services, then a brochure will suit you. We stock a large range of paper and specialise in fast turnarounds and last minute jobs. Professional graphic designer with retail and sales experience, ready to create great looking flyers and brochures for your business. Stand out from the crowd. Small and large print runs available, on digital or offset printers. Black and white or full colour printing. Single sided or double sided. Can match corporate colours. Pimp up the printing with spot UV, gold or silver foiling, embossing or saddle stitching. We’ll take your flyer from drab to fab. Can also fold, staple and cut. Comprehensive range of flyer and brochure services with free quotes for all jobs. Can handle last minute requests and will even deliver. When you have flyers and brochures produced and delivered to mailboxes or handed out locally, you immediately reach the target market you’re aiming for. Coupons or other incentives will motivate people to not only look at, but keep your flyer or brochure. Something seen on the internet may be easily forgotten, but an attractive design stuck to a fridge will be remembered! Once the materials have been designed and printed, the process that follows is quite simple. You simply need to have the items distributed. You can choose to mail to addresses that are listed in directories, drop the items off door-to-door, or hand them out at a public location in person. The use of flyers and brochures may not be the only component of your business’ marketing plan, but it can be very effective! Minuteman Press Frankston have the skills and expertise to provide you with quality marketing materials for your business.